As the ideas of Karl Marx swept through Europe in the late 1800s, they found their way into Russia. The Russian empire at this time was ruled by an autocratic tsar who refused to share political power, believing his sovereignty came directly from God. This made Russia a magnet for political radicalism and revolutionary ideas. In 1898 a newly formed group called the Russian Social Democratic Labour Party (or SDs) embraced Marxist theory. Five years later the SDs split into two factions called the Bolsheviks and the Mensheviks. Their split was triggered by conflicting views on tactics and membership. The leader of the Bolshevik faction, a young lawyer named Vladimir Ulyanov or Lenin, wanted a small but disciplined group of “professional revolutionaries”. This group would not be content with waiting for revolution but would make it happen, sooner rather than later. Lenin’s vision materialised in October 1917 when his Bolshevik party – by now backed by more than 200,000 soldiers and workers – seized control of the Russian government. Thus began the emergence of communist Russia and the birth of the Soviet Union. Once in power, the Bolsheviks set about transforming Russia into a socialist state. Just days after the Bolshevik revolution, Lenin issued a series of decrees promising radical reform. His government promised to end Russia’s involvement in the war, secure peace with Germany and bring all Russian soldiers home. The old symbols and structures of tsarist Russia – including noble titles, bureaucratic ranks and government departments – would be abolished. Private ownership of land was ended; the vast estates once owned by Russia’s rich nobles and landlords would be given over to the peasants. The Bolsheviks legislated civil rights and improved conditions for workers. Women were given levels of equality with men unheard of elsewhere in Europe, including equal pay, working conditions and voting rights. Social reforms like healthcare and literacy programs were introduced. These plans and promises created optimism among the Russian people, however, civil war and economic deprivation prevented the Bolshevik regime from fulfilling many of them. As weeks passed and unrest in Russia worsened, the Bolshevik regime resorted to undemocratic methods to maintain control. Elections for a constituent assembly were held in December 1917 but when they failed to return a Bolshevik majority, Lenin sent in troops to dissolve the assembly after just one day. Facing the possibility of counter-revolution both from tsarists and other socialists, Lenin ordered the formation of a Red Army and a secret police force called the CHEKA. When civil war erupted in Russia in mid-1918, the regime imposed a brutal economic policy. Dubbed ‘war communism’, this policy saw peasants forced to hand over their food supplies at the point of a gun. For three years Russia endured a divisive and bitter civil war between the Bolshevik Red Army and the counter-revolutionary ‘Whites’, a loose confederation of tsarists, democrats and non-Bolshevik socialists. 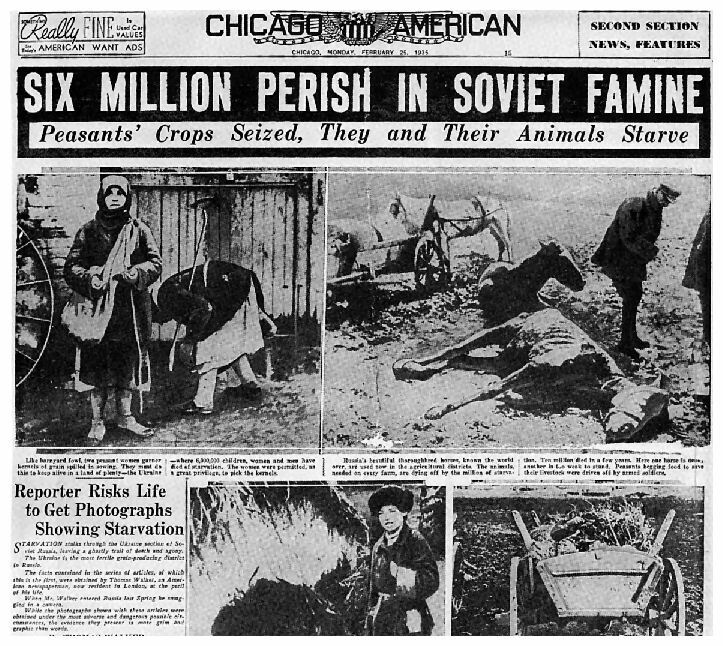 The Russian Civil War, Bolshevik economic policies and a series of severe droughts gave birth to a catastrophic famine that killed between five and ten million Russian peasants. Events in Russia terrified American capitalists, who feared similar outcomes if socialism was allowed to take root in the United States. The US government took a strong stand against the Bolshevik regime. Washington refused to formally recognise the Soviet Union and its government; it would not do so until 1933. The US and other Allied nations also provided military support for White counter-revolutionaries in the Russian Civil War. In July 1918, US president Woodrow Wilson approved the deployment of 13,000 American soldiers – known as the Polar Bear Expedition – to support the Whites. While American troops did not play a major role in the Civil War, they remained in Russia until 1920. This intervention by foreign forces only hardened Bolshevik attitudes to the West. Soviet propaganda, such as the image shown on this page, portrayed the western Allies as greedy capitalists who wanted to defeat socialism and re-enslave Russian workers. In 1921 the Bolsheviks secured victory in the Civil War and the Whites were dispersed or forced into exile. Now politically secure, the Soviet Union began to recover and rebuild after seven years of war. In January 1924 the Bolshevik leader Lenin, who had been desperately ill for many months, died after a major stroke. 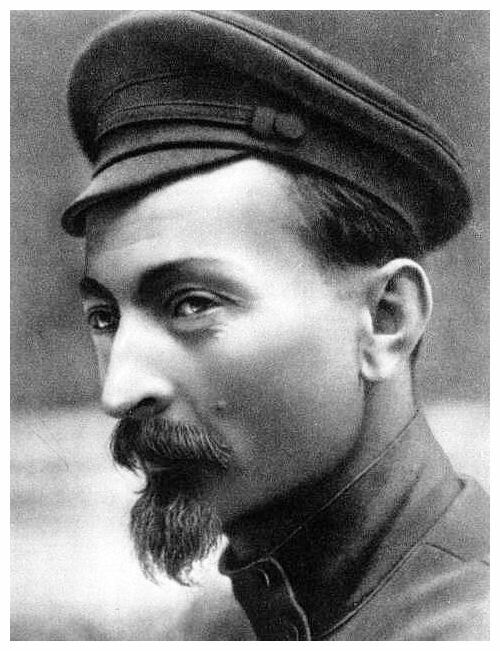 After a brief power struggle, power passed to Joseph Dzhugashvili, better known by his revolutionary codename Stalin. 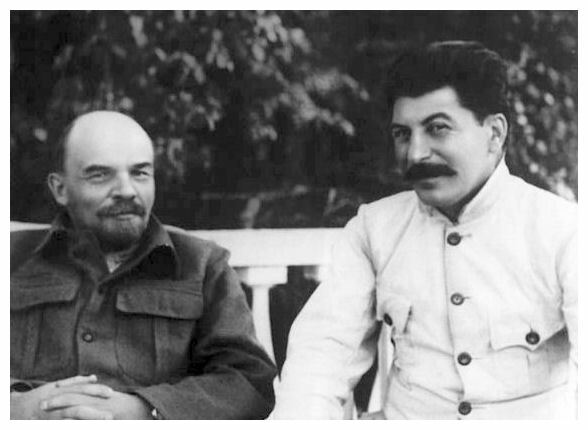 Unlike Lenin, Stalin was neither a figurehead, an intellectual figure or an obvious leader; his early duties in the Bolshevik movement included raising funds by robbing banks or extorting money from local capitalists. What Stalin lacked in political credibility, however, he made up for in ruthlessness, manipulation and cunning. Stalin also had a clear vision for the Soviet Union. 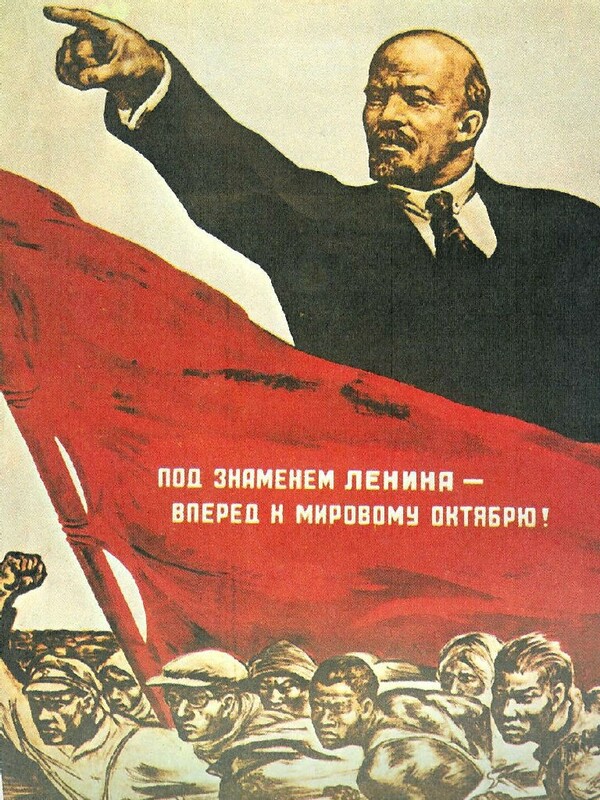 Unlike Lenin, who sought to promote revolution elsewhere in Europe, Stalin advocated “socialism in one country”. A paranoid who feared both foreign governments and internal opposition, Stalin wanted to transform the Soviet Union into a foreboding military power so it could withstand attack from its aggressive neighbours. As a consequence, most Soviet policies of the late 1920s and 1930s sought to industrialise, modernise and militarise Soviet Russia. The emergence of Adolf Hitler in Germany in 1933 only hastened these plans. Not only did Hitler despise Bolshevik communism, he nurtured long-term plans of eastern expansion that included large areas of Russian territory. While Stalin succeeded at industrialising the Soviet nation and hauling it into the 20th century, his reforms came at an enormous human cost. Stalin’s Russia was not the workers’ paradise once imagined by Soviet propagandists – in fact, for most workers it was an oppressive and authoritarian place, where the needs of the party and state took precedence over the rights of workers. Russia’s peasants fared no better. To improve agricultural productivity, millions of peasants were herded into giant collectivised farms to work for the state. Grain was seized and sold abroad to fund Stalin’s economic programs; this policy triggered another deadly famine in the mid-1930s. Those who refused to work or defied the Stalinist regime were whisked away by one of several secret police forces that operated under Stalin’s reign (the OGPU, NKVD and KGB). Some were liquidated and never seen again; thousands more ended up in remote Siberian labour prisons called gulags, where they were beaten, starved and worked to death. Atop all this misery, state propaganda maintained a personality cult that hailed Stalin as the saviour of his country. In film, posters and the press, Stalin was depicted as a benevolent leader, the protector of Russian women and children, a defender of the ideological traditions of Marx, Engels and Lenin. The reality was that Stalin called himself a Marxist and a communist but was very little of either. The Soviet leader was a totalitarian despot who had more in common with Hitler, his fellow dictator and arch-rival, than with true Marxists. To capitalists in the West, particularly the United States, Stalinist Russia was a case study of how flawed ideologies like communism created more human suffering than successful reform. Yet while Western nations loathed Stalin’s policies, they feared the industrial, technical and military power these policies had delivered to the Soviet Union. By the late 1930s, the world was pondering the possibility of a war involving two fast-industrialising dictatorships: Nazi Germany and Stalinist Russia. It would not have to wait long for this war to become a reality. 1. Before 1917, Russia was ruled by an autocratic leader called the tsar. Marxist ideas became popular in Russia in the 1890s and manifested themselves in the Bolshevik movement. 2. In October 1917, Vladimir Lenin and the Bolsheviks seized control of the Russian government. They attempted to transform Russia into a socialist state through sweeping reforms. 3. The new Bolshevik regime was unable to fulfil its promises due to internal opposition, civil war and economic deprivation. It resorted to violent and oppressive methods to maintain control. 4. Stalin became Soviet leader in the mid-1920s and sought to protect the USSR from external aggressors by modernising and industrialising. This progress came at an enormous human cost. 5. The transformations in Russia worried Western capitalists. They despised and feared communism but were also concerned about the Soviet Union’s growing military strength, which paralleled that of Nazi Germany. J. Llewellyn et al, “Communist Russia”, Alpha History, accessed [today’s date], https://alphahistory.com/coldwar/communist-russia/.